-	Just because a contractor is licenced, it does not mean that each person assigned to do things in your home will be licenced to do that specific job. -	“Work fully guaranteed” is a meaningless statement, as it does not specify who needs to be satisfied. 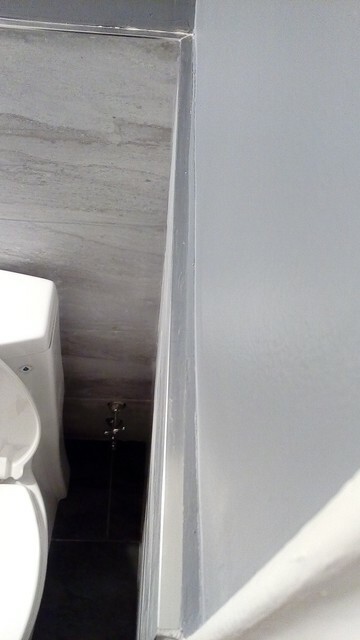 If you say that there’s a problem, but the contractor says there isn’t, the contractor wins the argument. -	Get everything, especially the final materials list, in writing, with both your and the contractor’s signature on it, before work begins. You should also demand sketches that you are to sign off on to ensure that everything is installed where you want it. I received neither a final materials list, nor sketches, which led to miscommunications, and in all but 1 instance, the contractor won the argument, as I didn’t want them ripping out tiles or walls again. -	Do not accept any deliveries, or allow any work to begin, until the site supervisor shows up on the first day. -	“Twelve working days” doesn’t mean consecutive. My 2 week job, that I was subsequently assured by supervisor #1 wouldn’t even need to extend to a second weekend, was still ongoing at the end of week 4, at which point I signed off on it to get my keys back and make them go away. -	Watch their promotional video closely. 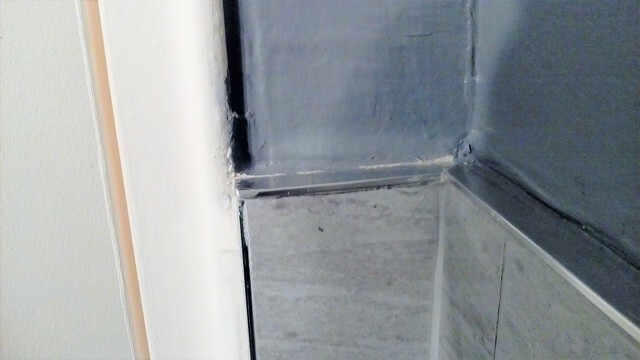 The CityLine “Transforming a tiny bathroom” gives an example of sloppy paint finishes at 0:47 to 0:50 and of a switch plate (near the door) that doesn’t fully cover the hole in the wall at 0:53. -	Assume that the workers will be in every room of your home, even when they have no legitimate reason to be there, and assume that your things will be damaged, even if you have taken the time to cover them all in plastic. -	Assume that your time will not be respected, and that people will be very late for meetings but will not contact you to let you know. 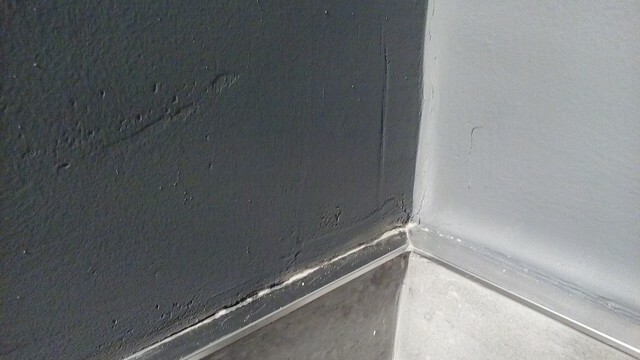 -	Some parts of my bathroom look much better than they did before the work started. -	The demolition crew taped down drop cloths inside and outside my apartment; were appropriately contrite (and cleaned up the mess) when they broke through a wall into my bedroom closet; and cleaned up everything at the end of the day, including vacuuming the carpet outside my apartment so that my neighbours didn’t have to deal with the dust and debris. -	The designer/salesperson was professional and provided valuable advice at the beginning of the project. -	None of the tiled walls are perpendicular to one another. 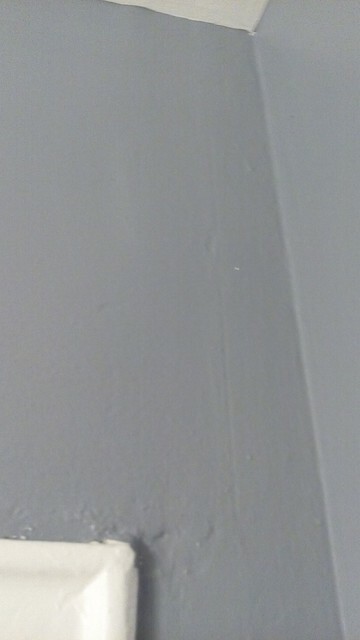 It is especially noticeable on the wall next to the toilet. 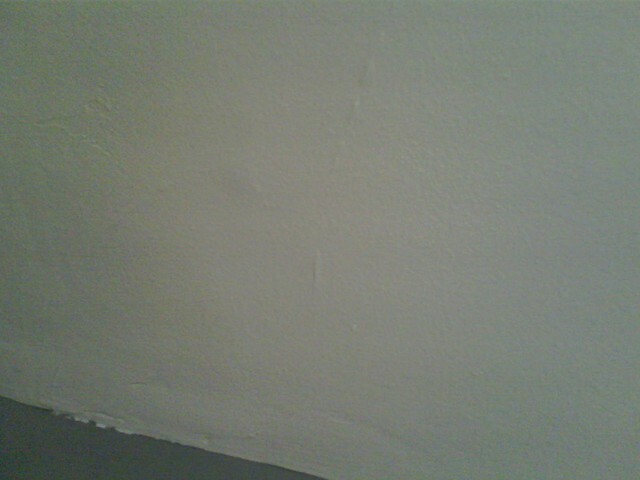 -	They did not skim coat my walls (per our contract). 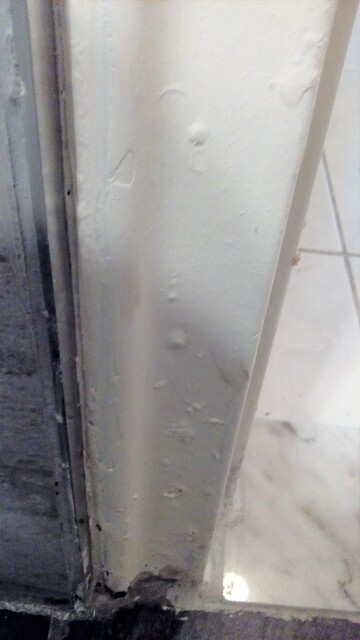 Instead they patched some of the flaws using plaster/compound (while leaving other flaws intact), did not sand properly, and then painted. 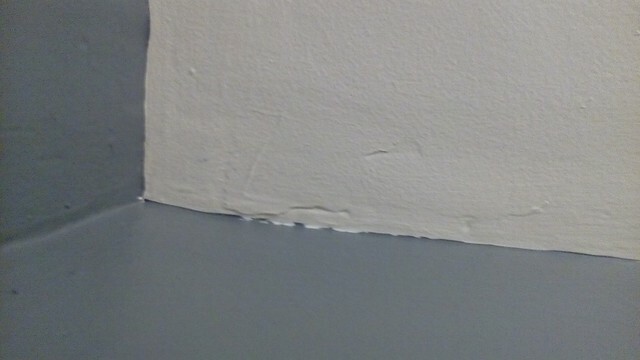 In at least one case, they used “DAP Fast ‘n Final lightweight spackling”, which has 2 stars out of 5 in Home Depot online reviews for not drying properly and being brittle and unsandable. They told me the reason it wasn’t drying and looked so bad is that my bathroom is too humid. 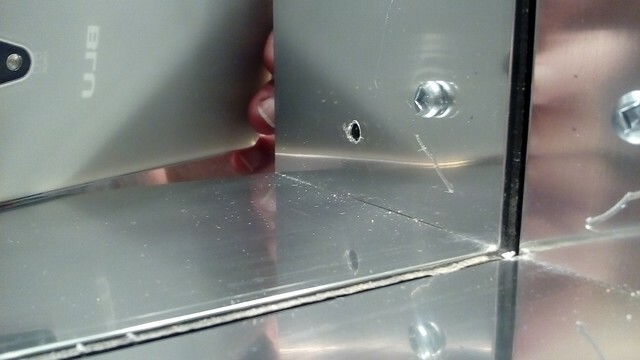 -	Almost everything that they installed, they damaged in some way (or it was damaged from HomeDepot, and they installed it in its damaged condition, rather than replacing with an undamaged product): the metal interior of the mirrored cabinet is badly scratched, and is also sharp; they gouged the plastic in the toilet seat lid, replaced it when I complained, and within a day it was scratched again; they scratched up the metal trim around the tiles; they chipped the floor tile right in front of the vanity in 2 small spots; the shower door rail on the inside at the top looks like someone took a rasp to it; the ceiling vent cover is warped where it screws in. 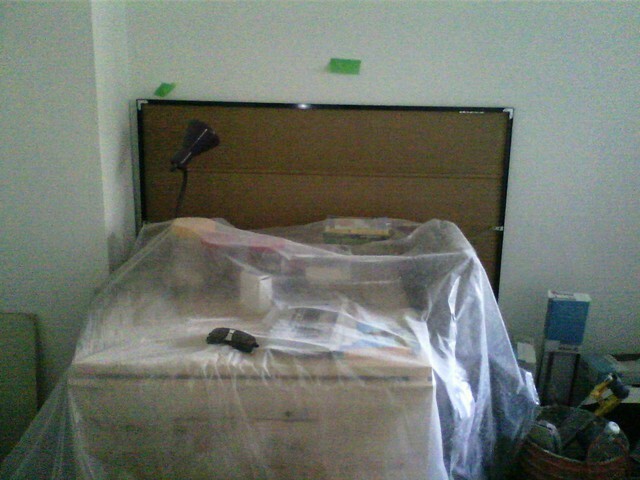 -	The vice-president/site supervisor was 3.5 hours late on Day 1 of the project. The demolition crew arrived on time (9:30), said that the supervisor was delayed but would be there soon, and proceeded to demolish the old bathroom. They tried texting him for me throughout the morning, as I had planned to go to work that day, and he had not contacted me to let me know what time he’d finally be there. We finally heard from him at 11:45 saying that he’d be at my home by 12:45 or 1. He arrived at 1:00 for our 9:30 meeting. This problem happened again on the Friday before he handed me off to supervisor #2. For days he told me that he would get back to me to let me know what time we were meeting on the Friday. Then, throughout the day on Friday, he told me that he would let me know what time “later”. At the end of the day, he finally told me to phone supervisor #2, after I had kept my entire afternoon open to accommodate his schedule. -	I came home unexpectedly one day and discovered that someone had exposed all of my electronics, including my carbon monoxide detector, to heavy dust in order to use a power bar to charge his cell phone. He had pulled my electronics shelf about a foot out from the wall and had lifted the power bar off of the floor, placing it on top of the plastic on top of the shelf. This not only lifted the plastic off of the back of the shelf, it also pulled everything that was plugged into it off of the shelf at the back. There is a perfectly good, functional power bar in the kitchen where they could have charged their phones. 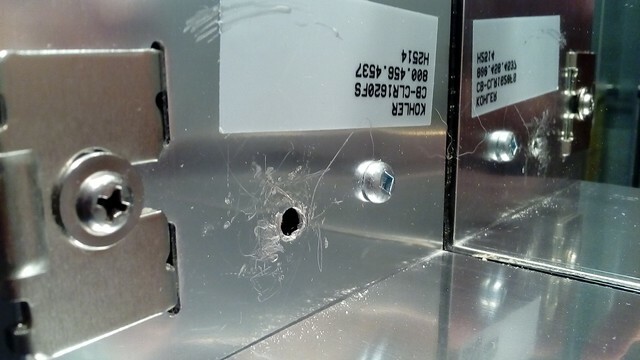 They knew about this because that is where they were plugging in all of their power tools. Every day when I came home, the plastic had been pulled off of my possessions in one area or another, exposing them to dust, and they kept telling me that it was accidental. -	when I cc’d the designer/salesperson on an email about a problem, the Vice-president told me that the designer shouldn’t be bothered anymore, and that I was to contact the vice-president (who was also my site supervisor #1). One week after that, the vice-president assigned me to a different site supervisor, who disagreed with me whenever I said there was a problem. -	For example, site supervisor #2 mansplained how to use a tap. 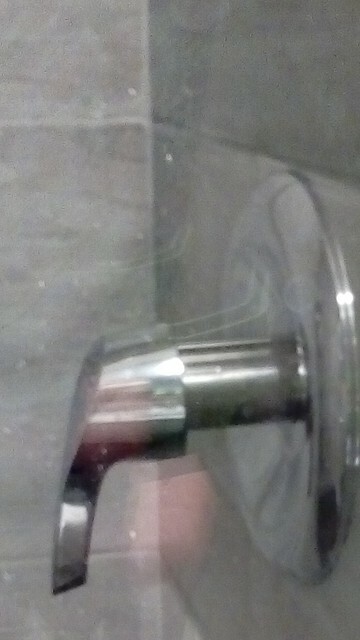 From his email: “Shower shouldn’t drip when in the "off" position, cause we did replace the cartridge and the stopper as well , it probably needs to be pushed a bit tighter when closing it off”. 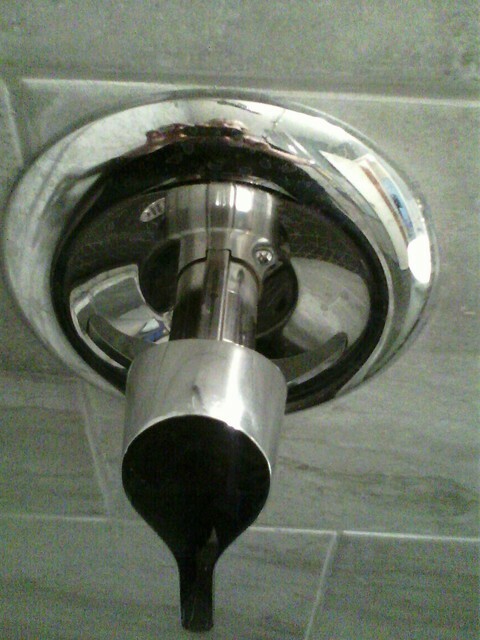 The fact that the shower still drips on a regular basis is apparently irrelevant. While I’m away on holiday, the main water valve to the bathroom will be shut off, because I can’t risk the shower being on the entire time I’m away. 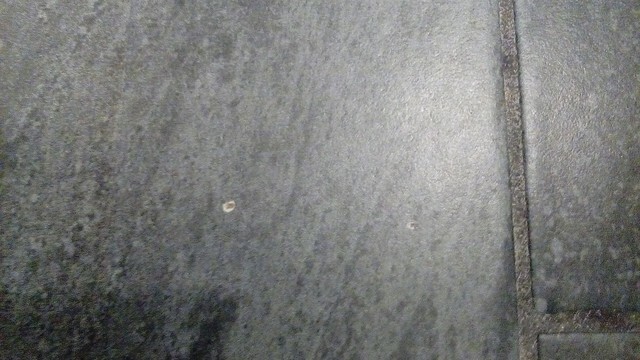 -	The shower tap was installed askew, meaning that it gaped about 0.75 cm from the wall plate on one side, and was grating on metal on the other side. 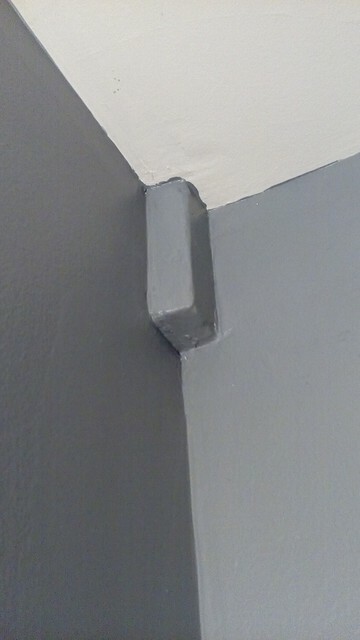 I assume this is part of the problem caused by none of the walls being perpendicular (i.e., the pipe is perpendicular, but the wall around it is not). 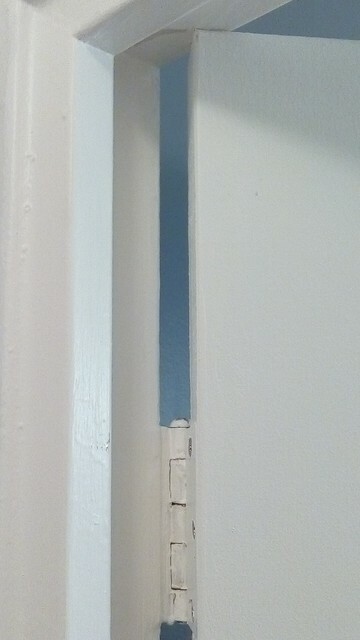 The plumber “fixed” this by extending the knob attachment pipe out 5 cm from the wall. This attachment feels very flimsy and shaky. I will have to hire a plumber to fix this. 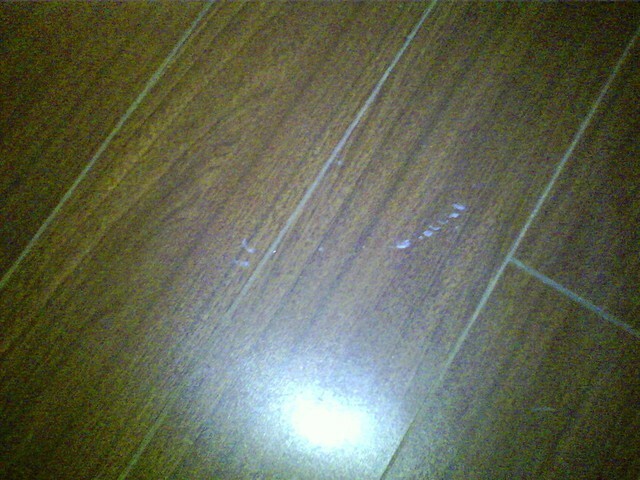 -	The vice-president convinced me that there was no need to demolish the old tile floor. He said that they could install the new tiles so that they were flush with the existing threshold (0.5” above the floor in the foyer), and that they would install a nice, new threshold that sloped gently down. What I got instead was a floor that is 1.5” higher than the previous floor, and has to be a step because it is so much higher. The new threshold is also wider than expected, because they shattered the tile in the foyer right outside the door and needed the threshold to cover it up. 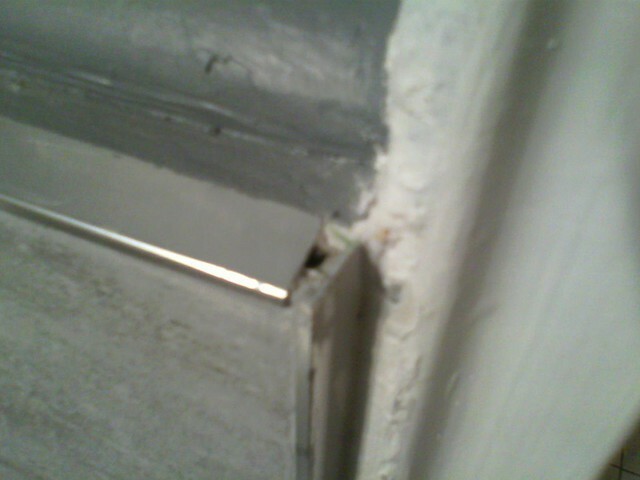 This means that the threshold had to be cut to fit around the outside door frame. 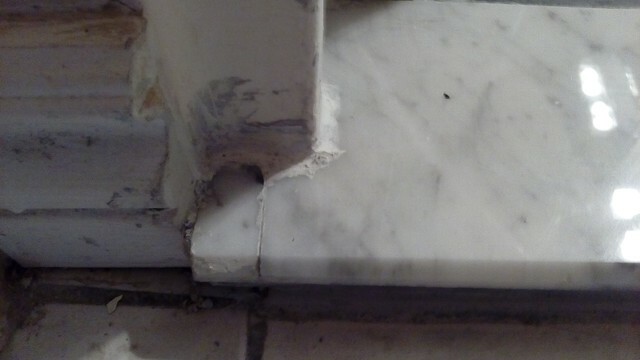 There is a joint in the stone of the threshold near the edge, and the finishes are sloppy, as are the cuts in the stone. In retrospect, I should have insisted that they remove the old tile floor. 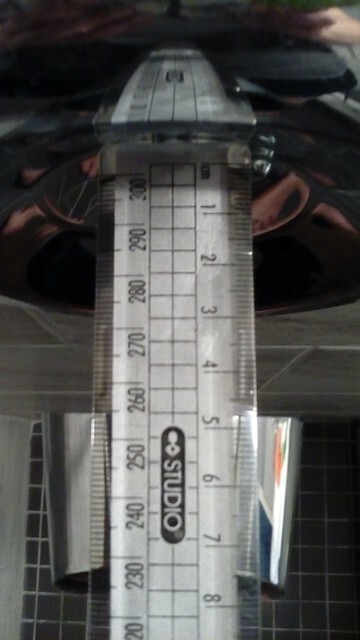 At one point, the plumber mentioned that my toilet bolts were really short. 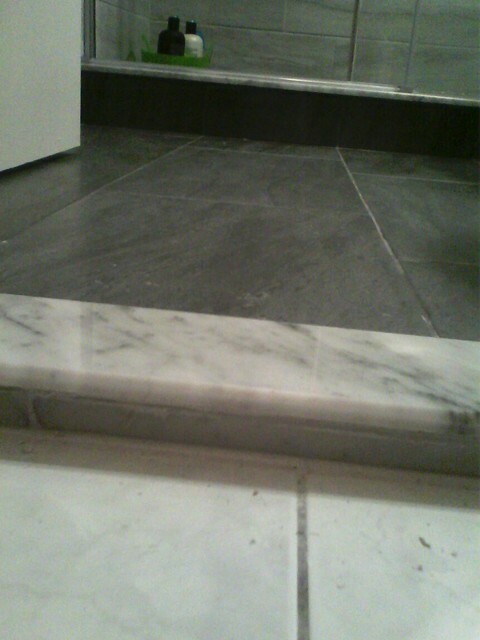 The reason they were so short and he had to replace them, is that the new floor is 1.5” higher than the old one. 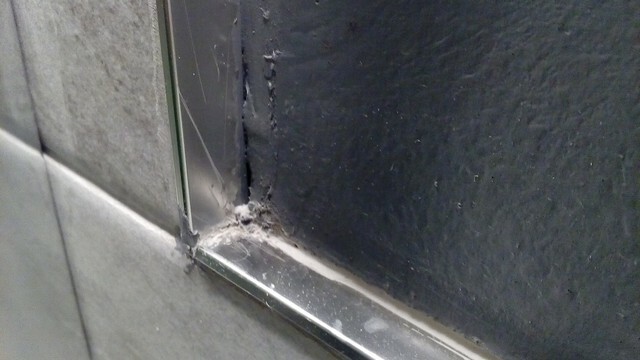 -	The metal corner finishes around the tiles are sloppy and were sharp. After 3 complaints and a cut on my arm, supervisor #2 had the edges filed so that they are still sloppy, but at least they won’t cut me again. -	Other than demolition day, they did not wear boot covers or put down drop cloths inside my home unless I specifically complained. When they did put them down, they didn’t cover all of the areas that the workers went. -	They did not respect my co-op’s rules or property. On at least one occasion, they worked for hours beyond the last time that they are permitted to be in the building. They were given the permitted hours twice in writing, and at least once verbally. Other than demolition day, they didn’t put down drop cloths and/or clean up their mess on the carpet outside my door until specifically asked by me (and one time by the Chair of the Co-op’s Board) to do so. This was a problem every day. I would come home and there would be a trail of dusty/wet plastery/wet painty boot prints in the carpet from my apartment door to the stairwell. 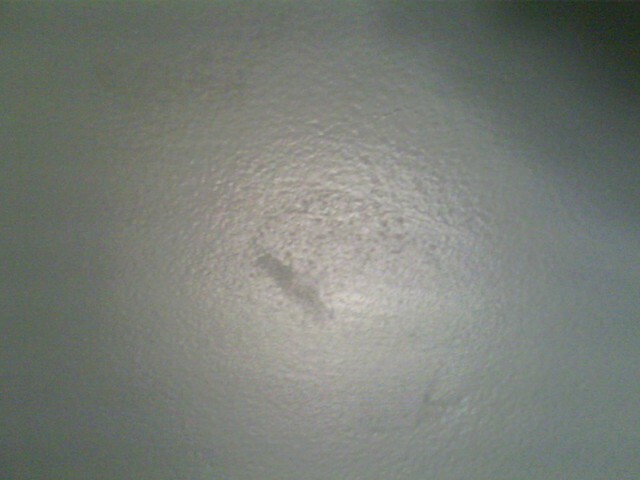 -	One day I came home and discovered coffee spatter on the inside of my front door and the wall next to it. Someone must have dropped their coffee cup and then not wiped up the mess. 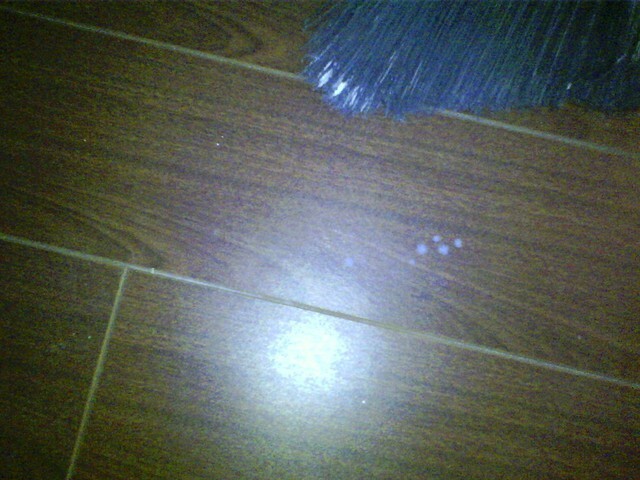 -	There are paint drips and spills in the grout, and on my foyer, living room, and kitchen floors. 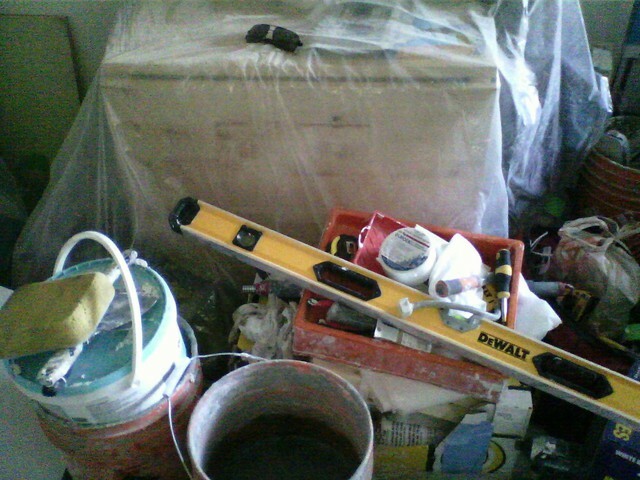 -	When I complained (and showed) that the painter(s) had painted over dust on the walls and in corners, rather than cleaning it up first, resulting in paint coming off the walls in small specks, site supervisor #2 responded “that shouldn’t happen, because there’s primer in it”. The issue was never resolved. 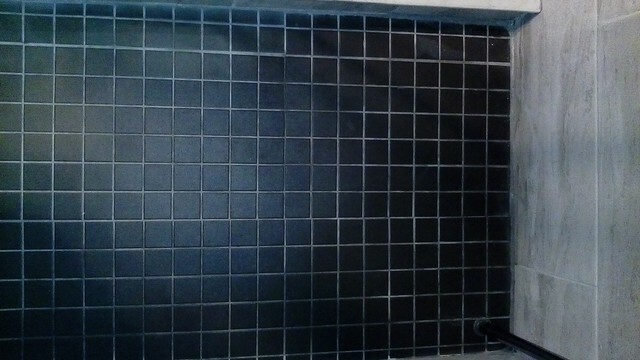 -	I told the site supervisor that I could live with grey tiles in the shower, as long as the upper walls outside were painted white, instead of the dark pewter that I selected when I thought I would have a white shower. 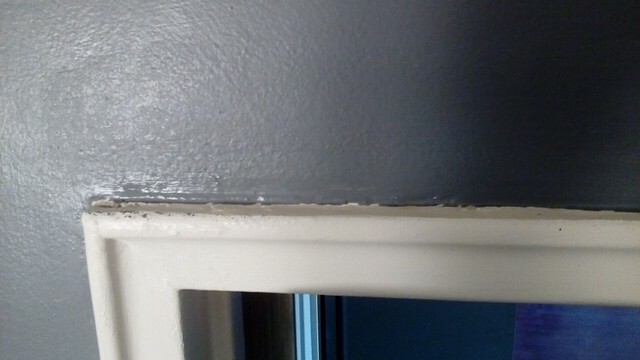 I came home and discovered that the walls were painted the original dark pewter anyways, and am now living with it. 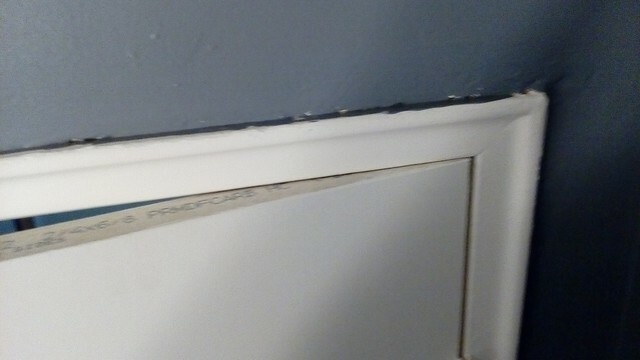 -	The bathroom door (which I paid them to replace) does not fit because they didn’t trim the height to match the old door. 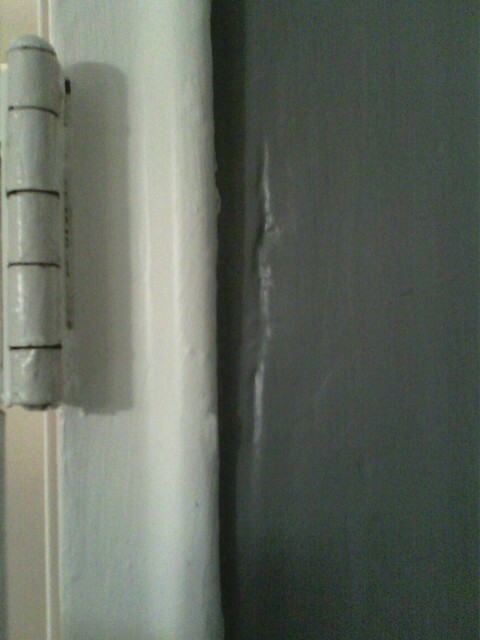 It now rubs on the doorframe at the top, and I have to force it to close. The latch also does not function properly, because it is installed at an angle, and does not protrude as far from the door as it should. 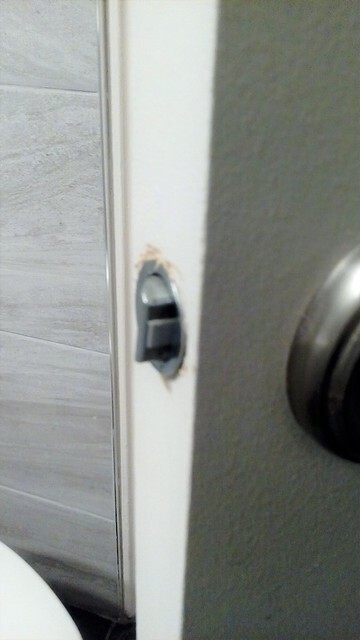 When I showed the problem with the latch to supervisor #2, he said as long as it actually latches, it is not a problem, and to fix it would create new problems, so it was better to leave it. -	They repeatedly used my personal items, such as the kitchen clean broom and dustpan, my dishrags, my pot scrubbing sponge, my paper towels, my tape, and my plastic drop cloths. I asked supervisor #1 to please give me a list of supplies that were needed by the workers so that I could buy them and make them available. 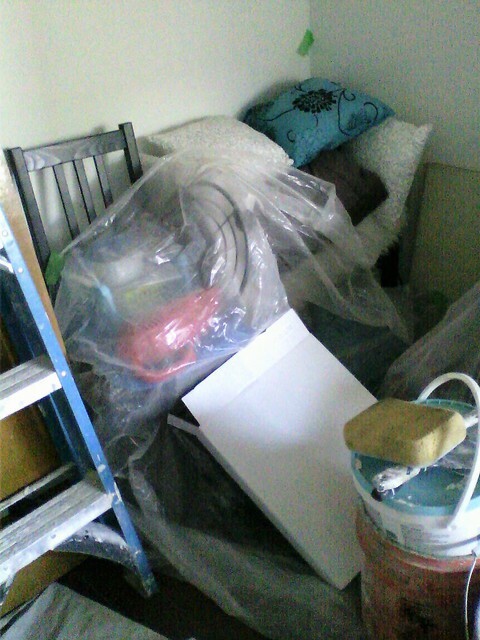 He said that the workers would provide all of their own supplies and that a “helper” had mistakenly taken my things. 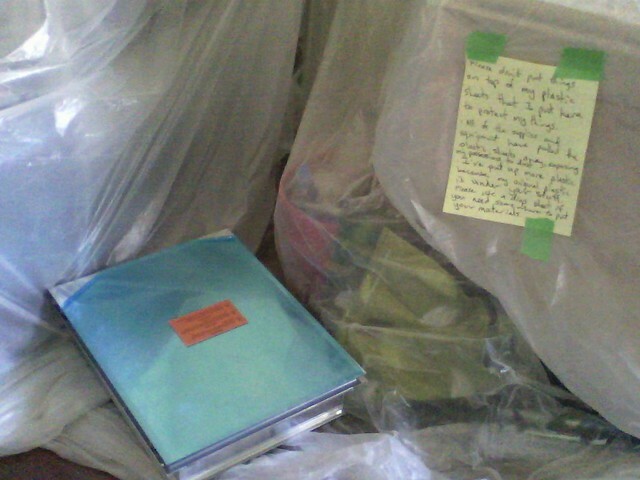 However, the taking of my things continued to happen on an almost-daily basis. 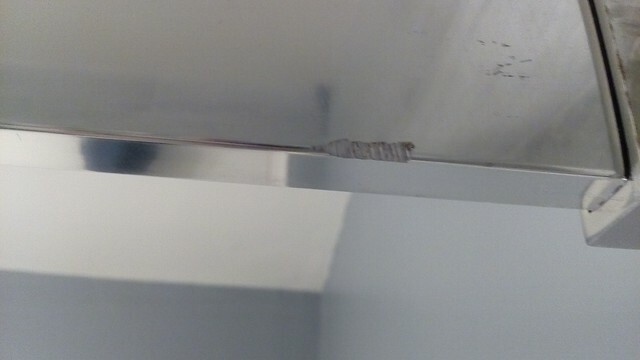 -	Supervisor #2 told me that I was wrong to want the towel bar installed on the tiled part of the wall, and that the attachment through the DAP crumbly spackling was sturdy 9and was also installed askew). It is now loose, and I will install it through the tile myself. 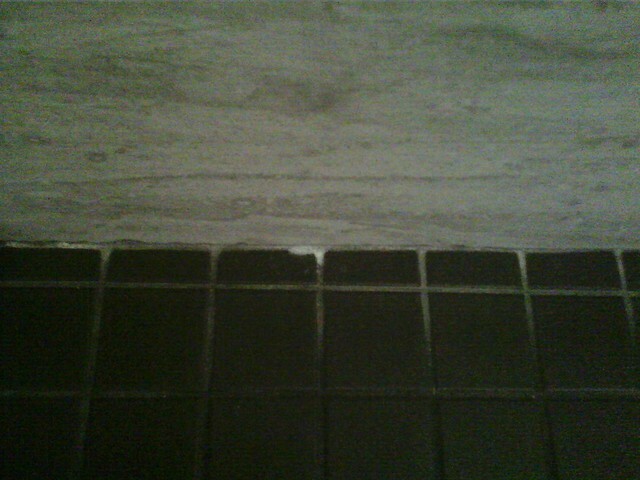 -	Supervisor #2 told me several times that he would clean up the grout haze and pencil marks on the tiles, but never did. I am slowly scrubbing this off of the tiles myself. My response to this very detailed review will be focused on what the contract consists of and communication issues that where totally false. 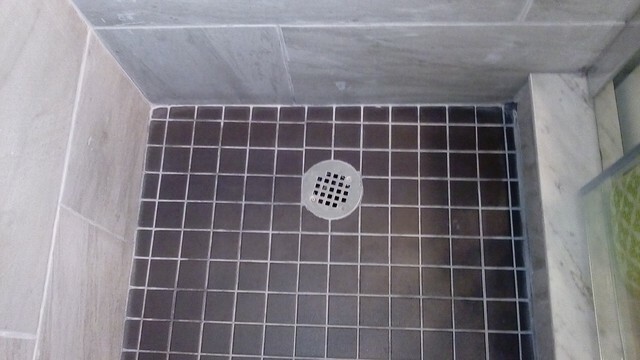 First off, we believe the main reason the customer is upset is because the tile we installed is different than what she thought she was getting. 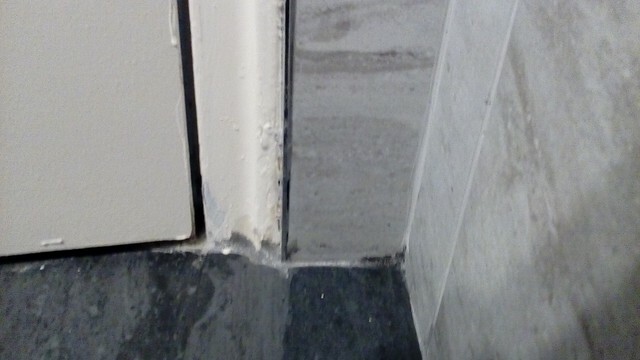 Customer had worked together with the sales person and agreed to the tile that was installed. They had discussed other options but agreed to stick to the original plan. Emails to and from the customer confirms that she agreed to stay with the original plan. 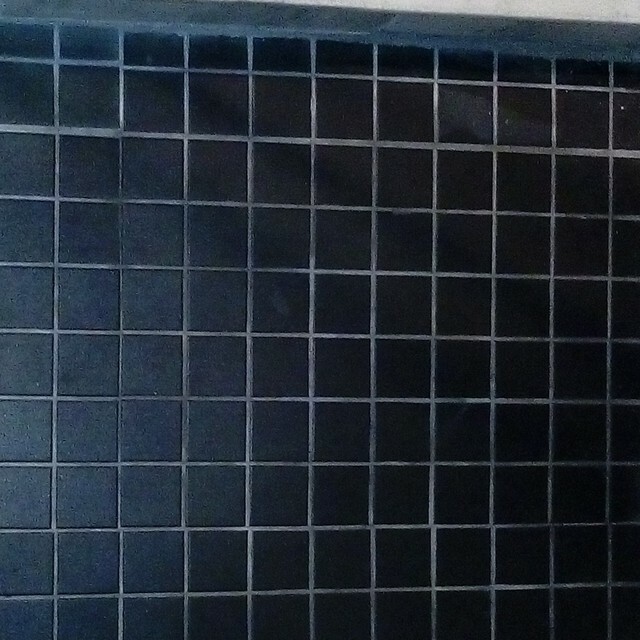 Even after i showed her the email, she still wanted us to change the tile. I agreed to change the tile if she would pay for ONLY the cost of the tile and we would do the labour and setting material at no charge. She refused to pay for anything and agreed that she would leave the tile as is unless we would do it all at NO cost to her. as for communication, the Supervisors always arrive to the home on Day 1 later in the morning to allow our Demo team to complete as much of the removal as possible, this way we can see what "unforeseen issues" may or may not be present behind the walls. We arrived on day 1 on time and there was never a set schedule or conversation that the customer had to leave until the time the supervisor was already on his way. 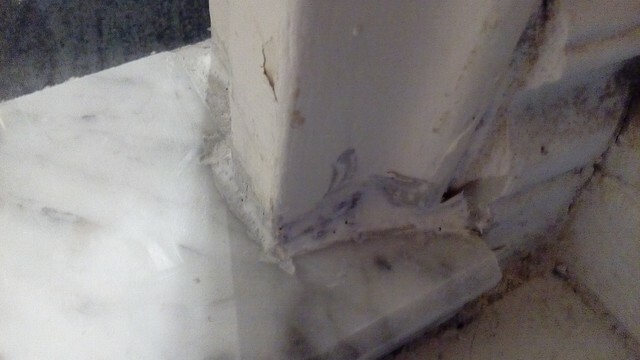 The building is over 60 yrs old and had numerous concerns including horrible plaster walls that crumbled once they where touched or simple vibrations. The plumbing behind the walls was not to code, leaking and was falling apart. This extra work due to "unforeseen issues" was discussed with the customer and repaired and NO extra charges where added to the contract. 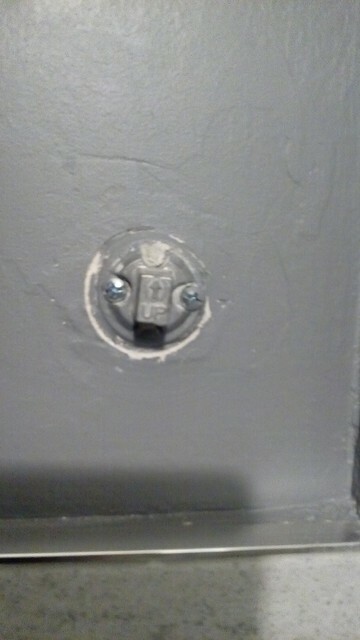 We also repaired some holes in the kitchen for the customer at NO charge. Communication between the customer and our supervisors was on a daily basis, sometimes 2 to 3 times a day. We discussed concerns and completed the deficiencies as requested by customer. We did not ask for a final sign off until all deficiencies where taken care of by our team including extra items that where not part of the original contract at NO charge. We called and confirmed with customer if all deficiencies where taken care of and asked if the customer was satisfied with the final walk through. The customer agreed to everything being completed to her satisfaction and signed off on the project. 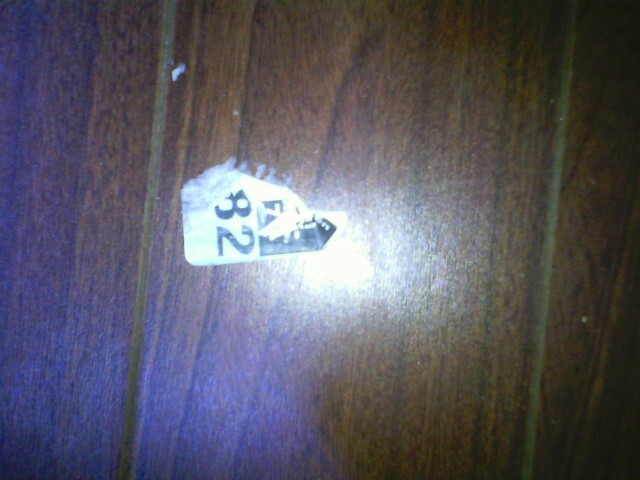 We also explained to the customer that we have a full 1 year warranty with our workmanship and she has yet to call us.